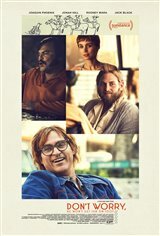 I love Joaquin Phoenix in most things, and he's good in this but the story is all just kind of right there, and he can't make up for Jonah Hill being in this. Everything he does is so damned annoying, why is that guy in movies? If I knew he was in this we wouldn't have even gone. Probably would've liked it a but more if Joaquin wasn't in it. Watching him makes my teeth itch. I love Joaquin and would watch him read a dictionary. He selects thought provoking movies and always leaves a lasting impression with his performances. Great cast in general. Fabulous movie, really enjoyed the acting of all the characters, it was well directed showing how John Callahan grow through his tragedy.